Size of this PNG preview of this SVG file: 500 × 250 pixels. Other resolutions: 320 × 160 pixels | 640 × 320 pixels | 800 × 400 pixels | 1,024 × 512 pixels | 1,280 × 640 pixels. Author Oʻzbekiston Respublikasining Davlat bayrogʻi. The officially defined colours are Pantone 313C for blue and 361C for green (source: , ). Drawn by User:Zscout370. 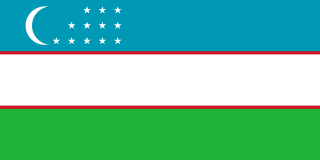 This work is not an object of copyright according to article 8 of the Law of the Republic of Uzbekistan No. 42 of July 20, 2006 on Copyright and Neighbouring Rights. results received with help of equipment designed for some kind of production without the person's implementation of creative activity directly associated with the creation of individual work. 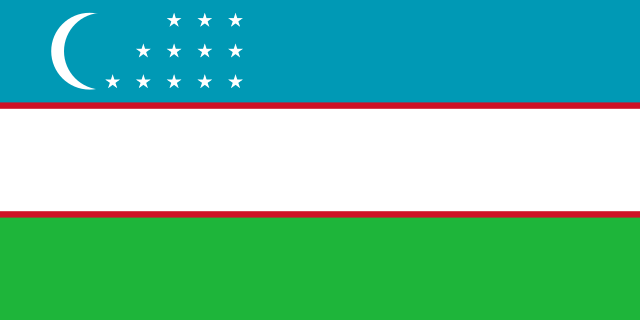 Comment: according to interstate and international compacts Uzbekistan is the legal successor of the Uzbek Soviet Socialist Republic, therefore this license tag is also applicable to official symbols and formal documents of the Uzbek SSR. Warning: this license tag cannot be applied to proposed official symbols and drafts of the formal documents, which can be copyrighted.